In December of 2006, three friends vanished when a snowstorm struck while they were climbing Mount Hood. For days the families stood vigil and prayed for their survival and rescue. One of the climbers, Kelly James, had been injured and was alone in a snow cave near the summit. He was able to have one final phone call with his wife and family before his phone went silent. Knowing something of his position, rescue worked to reach him. Before they could find him, Kelly died. His two companions, Brian Hall and Nikko Cooke vanished and were never found. This is the story of three experienced mountaineers and close friends who in spite of all their skill were unable to defeat nature gone awry. The best-laid plans and the dedication and skill of these people who dare to challenge mountains and win can be instantly undone when sudden storms, avalanches, icefalls, and whiteouts leave them powerless and alone. It is the story of brave rescuers risking their lives to help others. 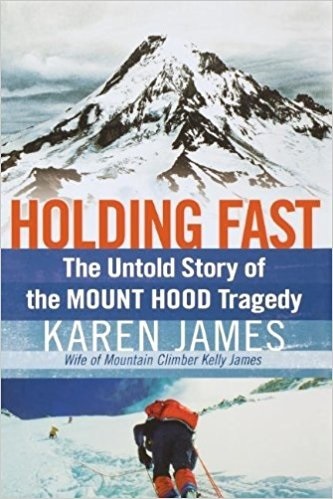 Although Kelly and his friends perished on Mount Hood, they were not abandoned to fate. Hours were spent in snowstorms and all kinds of weathers by rescuers genuinely concerned with bringing the climbers home alive. It is also the story of faith under fire, the gathering together of people to pray for three men many of them had never met. It is a tale of the sorrow and crisis of faith brought on when a loved one dies and you just don’t understand how God allowed that to happen. Above all, it is the story of how Kelly’s wife and children held onto their faith through it all. Karen Kelly writes a firsthand account of the unfortunate circumstances that lead to her husband’s death, the pain of parting, and the triumph of faith over heartache and despair. It is a fine read for persons whose faith is being tested by circumstances beyond control. The insight into the power of family and friends’ support; how prayer brings people together; and how it is possible to move forward positively after heartbreak is a guideline with which everyone can identify. My condolences go out to the families and thanks to Karen Kelly for sharing her testimony. I gladly give the book five stars!